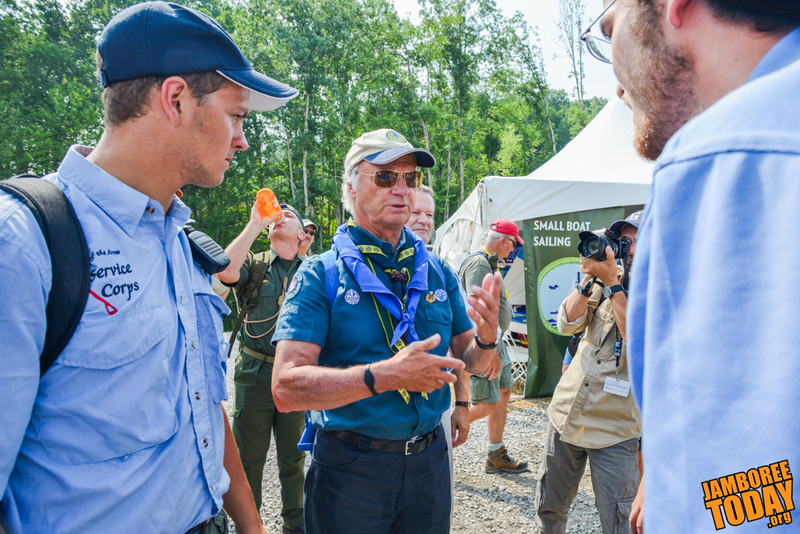 Carl XVI Gustaf of Sweden visits with Scouts. BSA photo by Randi Piland. One of world Scouting's staunchest supporters, Swedish King Carl XVI Gustaf, drew a crowd on Friday as he attended an award ceremony and then viewed part of the Summit, greeting and talking with American Scouts as he strolled the grounds. An important point about regal protocol: His Majesty insists on exchanging pleasantries here by using the Scout handshake. "Hello," the king said, shaking hands with Scouts and posing for a few photos with them. "How do you do?" The king, who joined Scouting in Sweden as a Cub Scout, serves as honorary chairman of the World Scouting Foundation. He also attended the 1981 National Jamboree in Virginia, and world jamborees in Thailand, England and, of course, in Sweden in 2011. In addition, as you would imagine, he regularly attends Swedish jamborees. "I thought (meeting the king) was a good experience," said Star Scout Curtis Moore, of Great Bend, Kansas. "I've never met a king." Moore was one of just a handful of Scouts who got to shake hands with King Gustaf and pose for a photo with him. For some, it was one or the other. Regardless, all Scouts said they enjoyed meeting him. Why did Moore want a photo with the king? "So I can take it back to my troop and show 'em something cool," Moore said. Besides, he said, he'd like to show it at his Eagle Scout court of honor as part of his jamboree experience. Jack Furst, BSA vice president of outdoor adventures and member of the BSA National Executive Board, served as goodwill ambassador for the Summit, showing the king around and telling him the Summit can handle up to 48,000 Scouts. "You'll be here forever," King Gustav observed. "We'll be here," Furst said. "The king is a great ambassador for world Scouting" and has been "a leader and ambassador of that movement for years," Furst told Jamboree Today. Eagle Scout Austin Pauling, of LaPorte City, Iowa, agreed. He described the king as "one of the biggest players in the international Scouting movement." Scoutmaster Carmen Ortiz, of Mexico City, Mexico, had wanted to meet the king when he was in her hometown for a week for an appearance at Dia Scout, Visita Fundación Scout Mundial, Scouts de México. The event was a major fund-raiser for Mexican Scouting. "We saw him in Mexico, but far away," Ortiz said, adding that she admires King Gustaf for his accomplishments. But that's not all. "He likes to be with the kids," she said. "He is a true leader." Accompanied by Carlos Aragon a Cub Scout leader also from Mexico City, Ortiz presented the king with a Mexican contingent neckerchief. Earlier, King Gustaf and wife Queen Silvia attended the awarding of the Distinguished Eagle Scout Award to Scott Teare, secretary general of the Geneva, Switzerland-based World Organization of the Scout Movement. Teare, formerly director of the Boy Scouts of America's International Division, took office as secretary general on Jan. 1. Also attending were Chief Scout Executive Wayne Brock, National Commissioner Tico Perez, and BSA President Wayne Perry. "We are honored with your presence," National Eagle Scout Association President Glenn Adams said in recognizing the king at the award ceremony. "Thank you so much for being here." Furst showed King Gustaf the activities on Goodrich Lake as well as the artificial climbing wall at Boulder Cove. Everywhere the king strolled, a small crowd followed. "That's our version of Brownsea Island," said Furst, pointing out to the king the replica site of Baden-Powell's historic British Scout encampment. Eagle Scout David Steinkruger, of Lincoln, Neb., was impressed by a years-earlier act of the king, when he wrote a letter to the Mid-America Council after a 2008 tornado killed four Scouts and injured 48 others at Little Sioux Scout Ranch, a council camp in Steinkruger's home state. "It was meaningful that he took the time to do that," Steinkruger said. Life Scout Tim Kussner, of Miami, Fla., said meeting the king was a "once-in-a-lifetime opportunity. I figured I would not get close to someone like him again." And, said Eagle Scout Brian Kirby, of Salem, Mass., "I was very impressed he took time to come here, with a busy schedule, to meet people." The late morning sun grew hotter and the humidity felt more oppressive, so it was time to leave. "King ... we've got to roll," Furst said. So they did.